Chrome: Before you get into another argument about politics, take a moment to see how the other side sees the world. EscapeYourBubble shows you what people on the other side of the aisle are seeing. It's no secret that we all live in self-reinforced echo chambers. While it's comfortable seeing stuff you agree with, it can leave you wondering where everyone else is getting their information. 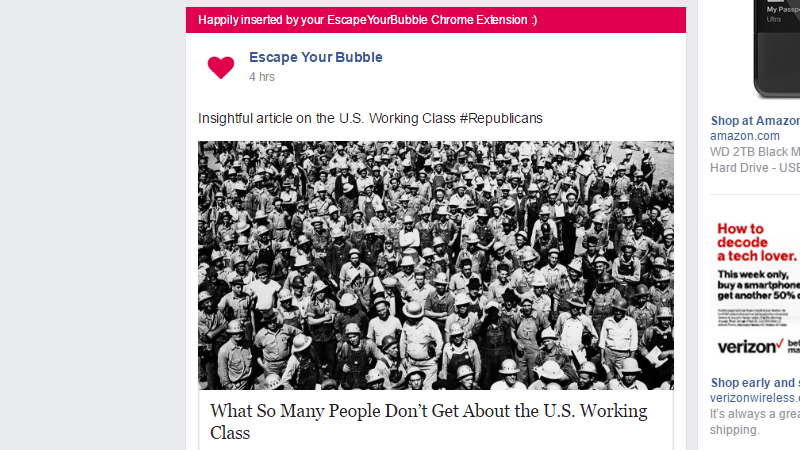 To help bridge that gap, EscapeYourBubble shows you curated news articles that appeal to whichever group you're not a part of. Right now, it lets you choose between Republicans and Democrats. Since the articles you see are curated, you're less likely to get wrapped up in an algorithmic circle churning out junk. The extension adds articles to your existing Facebook news feed, so you're not overwhelmed with everything that's made to appeal to someone else. You still get your feed, it's just peppered with stories that other people are seeing. Stories inserted by EscapeYourBubble are also labelled with a bright pink banner so you know where it's coming from. The goal here isn't necessarily to say that everything the other side says is right. However, if you want to connect with other people — and maybe even persuade them! — it helps to understand where they're coming from. You don't have to agree to read something.